Atmospheric. I was hopelessly lost I'll admit, but yeah, creepy. I found three parts but then I got caught. Nice game. Nice work. This reminds me of Homemake (https://www.kickstarter.com/projects/franklincosgrove/homemake), was that an inspiration? Especially love the building and chair generators. The buildings are impressive, but the chairs seems like a very complete solution. Every kind of chair is there - I wonder if Ikea have a similar program. This is ace. The movement controls are great, given a game that maybe wouldn't look as nice updating every frame. Cool tech that would be genuinely useful for an RPG. This is cool. Liked the transparent glowing style, and the sound effects are great. I was kinda hoping to find a gun, pick it up and the robots would all turn aggressive. I guess you just have to pretend to be friends sometimes. An accomplished and playable game. Fairly obvious that it's a 3D grid, but it feels like an explorable place. I like the prefabs for climbing the walls and the fact there are caves and different styled regions. Couldn't find the troll though! But nice #procjam entry! A few years ago I decided I want to make a music game that does a bit more than automatically analyzing a beat, so I started work on a game where I interpret the music myself and weave all the moods, themes and melodies of music into the game environment, animations and enemy attacks. It's been a lot of work, mostly in my spare time, but this weekend I was very pleased to be able to share a free beta of Substream on itch.io. Substream is a third-person on-rails aerial shooter for Windows PC. 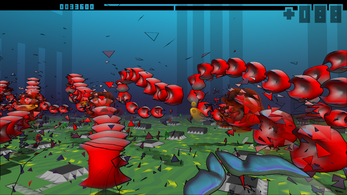 Space is looped so that you effectively have infinite aircraft, and each enemy appears ahead of you in multiple positions simultaneously. It's been built in a custom DirectX engine (mainly because I started working on it before engines like Unity and Unreal became cheap and popular). For that reason I'm always keen to hear about compatibility issues and bugs (hence a beta).